Ahead of 2019 general elections, President Muhammadu Buhari and vice-president Prof. Yemi Osinbajo will participate in a live TV two-hour town-hall programme at the Ladi Kwali Conference Centre, Ballroom of Sheraton Hotel Abuja. FOX NAIJA will bring you up to date with proceedings from the town hall meeting. The town hall meeting according to a statement by Festus Keyamo, director, strategic communications, APC Presidential Campaign Council will start by 8pm. 9:53: And to both of them:If you lose, will you accept the result? 9:53: Moderator to Buhari: Mr. President, there have been concerns about your health. If you win, are you fit and healthy enough to lead? 9:47: Professor @ProfOsinbajo said the economy was already in decline when the new administration took over. He said there was no saving and with low oil price and low oil production. He said there is now growth. 9: 33: Osinbajo tries to intervene but the moderator cuts him short and ask him to let Buhari speak for himself. 9:33: Moderator: Do you believe the video is fake or real? 9:32: Buhari expresses doubts about the authenticity of the Ganduje bribery videos, and mentions something about the kind of technology used to get those videos. 9:32: On the issue of Ganduje bribery scandal, President @buhari said the Kano state assembly has the right to deal with the governor if the allegations are true. He said he hopes to get answers when he goes to Kano for his campaign. 9:30: Buhari is re-directed to the Ganduje matter. 9:38: 'I can't afford to get frustrated," he says, to which the audience applaud. 9:37: Moderator to Buhari: Are you getting a little bit frustrated by the slow pace of your fight against corruption? 9:35: Moderator to Buhari: Are you getting a little bit frustrated by the slow pace of your fight against corruption? 9:31: The President is asked if the people should expect the same thing from him if re-elected or if he would step up efforts. 9: 30: The President is asked why the bribery allegations against Abdullahi Ganduje, Governor of Kano state, have not been investigated. 9:26: On the difference between @APCNigeria and @OfficialPDPNig , @ProfOsinbajo said at the core of the APC is a core belief which is social change. He said regardless of whether some PDP join the party, the ideology of the APC will not change. 9:25: Moderator: Many Nigerians, the PDP and APC are two sides of the same coin -- because many people from PDP have gone to APC, and vice versa. What is the difference between these two parties? 9:23: "Poverty doesn't just disappear; you have to deal with it," Osinbajo says. "And we are dealing with it every day." 9:19: Osinbajo's explanation is that this government has done more to fight poverty, despite earning less, than the PDP government did in 16 years despite earning significantly more. 9:17: Another member of the audience asks the President what he would to people who have stolen the country dry, were to gain re-election in 2019. 9:16: He says that since the President has explained that we won't make progress in security unless we get more money, and that a corrupt fellow like Babachir Lawal had been sacked, all that was left was for him to be told the problem with the economy, so that he could go home to decide whether to vote for him in February or not. 9:16: Andrew Ogboro says Buhari has done very well in the last four years. However, corruption, security and the economy were the campaign bases of this administration in 2015. 9: 14: President @MBuhari said Boko Haram are being supported by forces outside Nigeria. He said military needs more funding to continue to achieve success. 9: 06: On Boko Haram - The technically defeated Boko Haram is still killing people in the North. What has really gone wrong with your war against Boko Haram? 9:02: Osinbajo gives a few examples, including the case of people who return assets rather than go to court with the EFCC. 9:01: The moderator asks the Vice-President, being a lawyer, to explain cases of people forfeiting their assets to go government without a court conviction. 8: 52: On what the government is doing to end farmers, herders clash, @ProfOsinbajo said the minister of environment is looking at the effect of desertification. He also emphasize the need to recharge the Chad basin. 8:51: Osinbajo explains that the solution being devised by the government is a mixture of ranches and grazing areas. 8:40: Vice president @ProfOsinbajo said federal government do not own lands and that only states control lands. He said governors were urged to support the government in creating spaces to facilitate grazing or ranching. 8:36: Speaking a question on disability bill, President Buhari says he "honestly cannot remember" how far the National Assembly had gone on it. 8:34: On solutions to the Almajiri problem, Buhari says it is important to look at allocation of resources to the federal, state and local tiers of government. 8:15: On Babachir Lawal, President Buhari said his administration, as opposed to his military days cannot prosecute people without following due process. 8:15: Asked about the case with Babachir,and why the EFCC still has not investigated the former SGF, President Buhari says " to be fair to individuals, then the people should help with evidence and trust the system and allow the EFCC and ICPC to do their job "
8:14: The president denies that his administration has ignored corruption allegations from inside his presidency. 8:04: The town hall meetings kicks off as President Buhari and Vice President Osinbajo are seated Their citations are recited. According to Keyamo, attendance to the event is strictly by invitation, Leadership reports. “All guests are expected to be seated by 7:00pm,” the statement stated. 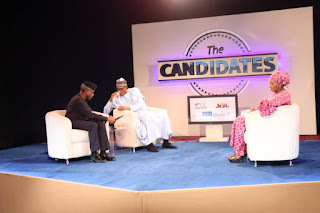 “The presidential series, which is titled “The Candidates”, is designed by the organisers to have both the presidential and their vice-presidential candidates of selected political parties on stage at the same time and at different dates to take questions from the moderator, Kadaria Ahmed, and from the general public through various platforms. “The programme would be broadcast live on NTA, which shall in turn provide the live feeds to other partner stations like TVC, Wazobia TV, Oak TV and on all Radio Nigeria stations. It will also be streamed on-line at dtv.media to enable Nigerians in diaspora to participate. “Nigerians are encouraged to kindly tune in to participate,” the statement added. Meanwhile, FOX NAIJA had reported that President Buhari may not attend the January 19 presidential debate according to the All Progressives Congress. The party said the debate is one of the mediums through which presidential candidates engage the public on their programmes and Buhari may choose not to use the medium.